Jim & Kathy Smith/On the Go! Retirement has been very busy for Jim and Kathy Smith. 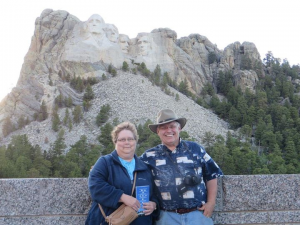 Jim sent a summary of their experiences in 2013, family activities and a trip through 9 western states to check the scenery. They purchased a travel trailer for that one. Just to stay busy at home, Jim started a business, Heritage Carving and Woodworking, LLC. He has his very own CNC woodworking machine. And, as you might expect from the guy who gave us The Advisor for so many years, Jim has his very own website on Facebook for the company. Here’s the link: https://www.facebook.com/HeritageCarving. Scrolling down his posts you’ll find some very nice work. Those who worked with Jim know his care for detail and skill. That’s all continuing in this new interest. Best of luck Jim & Kathy!